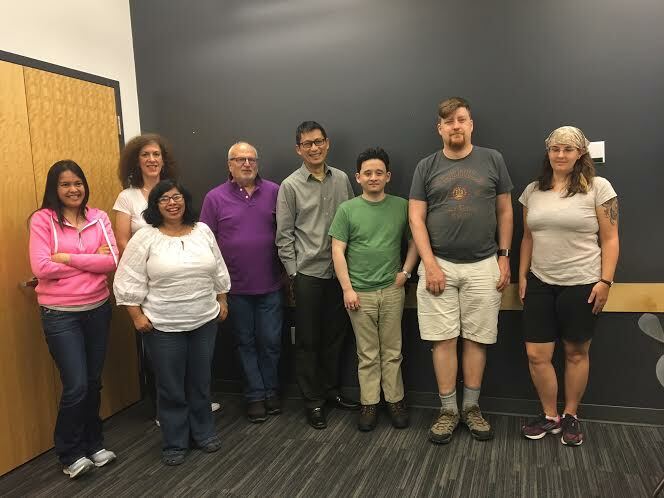 Our April meeting was held on Thursday April 21st at the Community Room of the Terry Salman branch of the Vancouver Public Library (due to Perks being closed). Turnout was uncharacteristically low (10 members) but our enthusiasm wasn't, and we had fun seeing, showing and learning about OMAS fountain pens. Many thanks to all who attended and special thanks to the VPL (esp. Karen at the Terry Salman location) for graciously allowing us to use this room for our meeting. Congratulations to Bruce on winning the door prize---a copy of the PCA (Pen Collectors of America) magazine "The Pennant" (generously donated by Christopher R)! Longtime VPC member (and Italian fountain pen collector extraordinaire) Glenn Marcus got the ball rolling by telling us about his experience visiting the OMAS factory in Bologna, Italy in 2007 (you can read about it on his wonderful pen blog here). 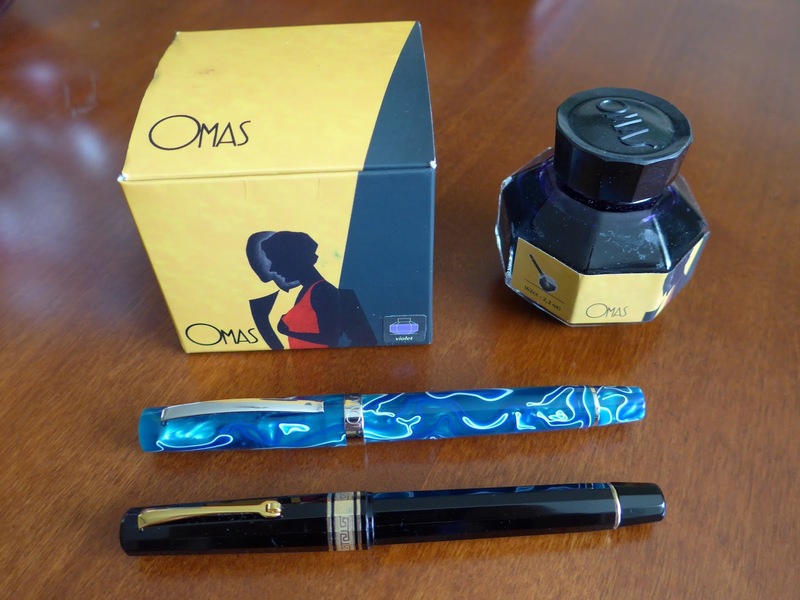 Sadly the company closed its doors a few months ago (Glenn posted an eloquent piece on this topic here) so there won't be any new OMAS writing instruments being made in the forseeable future. Glenn brought his extensive OMAS collection to the meeting and spoke about the different models---first and foremost, the 'Arte Italiana' line, the beautiful, faceted (12-sided) fountain pens that immediately spring to mind when one thinks of OMAS (examples shown were: the old- and new-style Paragons and the new-style Milord, beautiful examples in celluloid---Bronze Arco, Green Arco, Royale Blue and 'Wild'---and black vegetal resin), the new Bologna model in the 'Burkina' celluloid, a gorgeous Ogiva limited edition made for the Novelli Pens store in Rome, the lovely 'Extra Lucens' model (the 2013 Limited Edition), an old-style '360' in the 'Magnum' size, along with its new-style counterpart, and several of the 'Vintage 360' models (the clear models that came in a variety of colours). I could have taken photos of Glenn's OMAS fountain pens, but his photography is so much superior to mine and you can see almost all of the pens I mentioned when you click on the individuals links on this page of his pen-related blog. We went around the table and those who had OMAS fountain pens to show and discuss did so---Graham brought his Milord in Aubergine with beautiful rose gold trim (he forgot to bring his OMAS '90 Italia'), Natasha brought her new-style Milord in that wonderful Bronze Arco celluloid and two Ogiva Alba fountain pens, Bruce (another Italian pen enthusiast and collector) brought two old-style 'Bologna' models (including the version made for MoMA) along with a lovely OMAS in Blue Royale celluloid and a small 'Dama' (the Gentleman's model). Christopher R had an older OMAS fountain pen from 1957/1958, and some very old OMAS ink from 1938, but unfortunately he left them at home. We also saw some of our members' newest fountain pen acquisitions (which is always our secondary topic) including Mindy's cool vintage Pilot Murex, Christopher's very old Caws pencil holder from the 19th century and an Eclipse 'Hooded Knight' model in seafoam green, Alejandra's glossy black Parker '51' set with gold-filled "converging lines" caps (a heck of a bargain for what she paid---well done, Alejandra! )and two new pens that Jerred acquired recently---a Delta 'Unica' and a Pilot 'Seremo' FCM-500. The latter pen can be found (new stock) for $40 USD and sports a 14K gold nib, an amazingly low price point for a gold-nibbed pen. Our next meeting will be held on Thursday May 19 from 6:30pm to 8:30pm or so, and will almost certainly be held at our usual venue---Perks pen store on Cambie Street in Vancouver---but check our blog for any updates. The topic will be "Extra-Fine Nibs", so bring your examples (both modern and vintage) of fountain pens that have this type of nib. Thanks to Mindy for the theme idea. Hope to see you then!